Please come to this important Town Hall Meeting - join us along with members of the Los Angeles Fire Department for an important meeting as we rally for more emergency services in Sylmar. 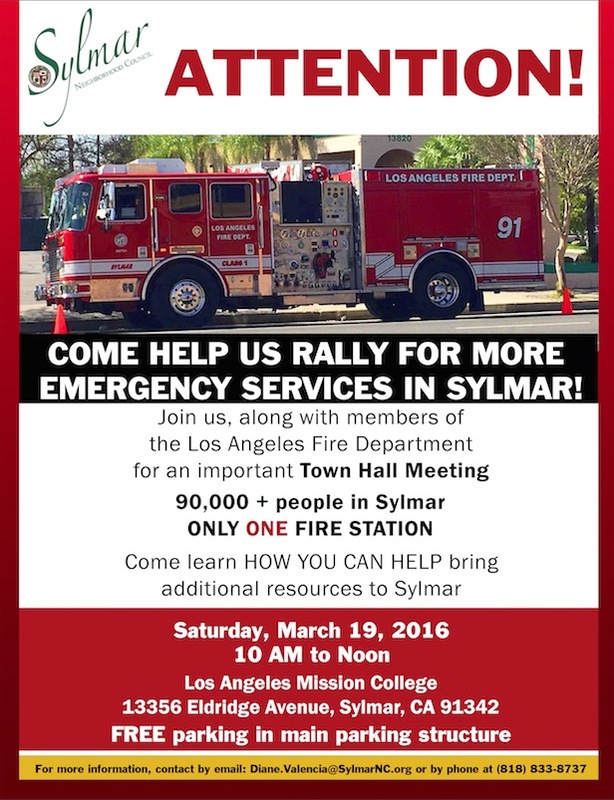 Sylmar has 90,000 people and only 1 Fire Station (#91) with 1 Fire Truck and 1 Ambulance! Sylmar is the 4th busiest fire station in the Valley and has the least amount of equipment and manpower. Thanks for posting this. I've followed Diane's quest for bringing Sylmar up to the same fire protection standards as most other LA communities and she is to be congratulated for her hard work and findings. I sure hope a lot of our hang gliding enthusiasts can make it over to that meeting on Saturday morning before flying. I understand that this can happen only through a large community response. When Sylmar residents and visitors need a response to 911 emergencies, they cannot afford longer response times than others in our city. This is especially true for hang gliders as well as when we have one of our pilots town, we need the quickest paramedic response possible. Can we move this discussion to "politics." Perhaps Jeff can do that as I don't know how. Dan, the author, did try to post it on another section but he had trouble and it wound up here. OP wrote: Can we move this discussion to "politics." This belongs right here OP. The proximity of a fire station to our LZ or the availability of EMTs may mean to the difference between life and death to an injured pilot. Agreed. I was trying to poke fun at the forum content nazis whom have been treating our beloved BobK unfairly. OP wrote: Agreed. I was trying to poke fun at the forum content nazis whom have been treating our beloved BobK unfairly. Bob's coming to the fire station meeting? NME wrote: Bob's coming to the fire station meeting? That video shows the Torrey Hawks Hang Gliding Club being added to the Torrey Pines City Park Advisory Board as a result of my efforts with the San Diego City Council. It's ironic that while the City of San Diego recognized the Torrey Hawks as a representative club for the sport of hang gliding on the Torrey Pines City Park Advisory Board (as shown in the video), U$HPA refused to do the same on the Torrey Pines Soaring Council. As a result, there have been long periods where the Soaring Council was made up of Sailplane pilots, Paraglider pilots, and RC pilots ... but NO active hang gliding pilots. Bob, U gunna run for Sherri's seat? You've got mad political skills, connections and favors owed in the community. I'm sure the entire Torrey crew and harbor seal people will vote your way. You're a shoo-in. Have you thought about hiring lawyers to write aggressive letters to Sylmar's local neighborhood council members? OP wrote: Bob, U gunna run for Sherri's seat? You've got mad political skills, connections and favors owed in the community. I'm sure the entire Torrey crew and harbor seal people will vote your way. You're a shoo-in. That's two posts in a row referencing me hiring lawyers to write nasty/aggressive letters. Care to back that up with facts? I won't be holding my breath. With regard to writing letters to Sylmar's community council members, what problems are you having OP? Just you're own quotes. You've apparently hired 3+ different law offices to encounter the San Diego City Council and USHPA. Our problem up here is a lack of vitamin BobK. Drive on up, we need you. NME wrote: The proximity of a fire station to our LZ or the availability of EMTs may mean to the difference between life and death to an injured pilot. Don't forget to mention the quick response time to fires that might be started by pilots who accidentally drop burning smoke canisters from their gliders. OP wrote: Just youre own quotes. You've apparently hired 3+ different law offices to encounter the San Diego City Council and USHPA. Still no facts supporting nasty/aggessive letters OP? Where do you get your misinformation? this is a chance to clear the air. I can only find your statement that you've hired 3 law offices. And only one letter your lawyer has written to ushpa. The Lightner family has taken your threats seriously. This is what Sylmar needs to be effective at our council meetings. Iâ€™ve asked you before to quit trying to pick a fight with Bob, and Iâ€™m sorry that I have to ask you again. Iâ€™m trying to avoid having to ban anyone from the forum, not Bob, not you, not anyone. If you canâ€™t find more constructive entertainment elsewhere, then at least pick on me instead. Thanks. I don't mind Ken. It's par for the course from the USHPA loyalists. As the new Regional Director in this region, what's your plan for providing oversight of the continual violations at Torrey? Are you going to visit them every day to keep an eye on them? Really, what's your plan to keep them from continuing to bleed the insurance/RRG money that pilots have invested in USHPA for decades? OP wrote: this is a chance to clear the air. I can only find your statement that you've hired 3 law offices. And only one letter your lawyer has written to ushpa. The Lightner family has taken your threats seriously. Orian, putting in writing that I've threatened anyone (including the "Lightner family") is libel. You may find out which law offices I employ rather quickly if you do not retract your statement immediately. Spirited discussion is one thing, libel is another. OP, I hope you'll consider the retraction I've suggested since threatening a Council member (or anyone) is a serious offense. In the spring of 2008, David Jebb had banned myself and David Beardslee from Torrey Pines. After I defeated Jebb, I hired a lawyer - at my expense - to write a letter to Jebb informing him that David Beardslee and I were asserting our right to fly at Torrey. The letter was delivered, and we showed up shortly afterward with another copy and asserted our right to fly. We flew. I paid the cost of that letter and never sought compensation from Jebb. When I was Regional Director, I asked to attend an Executive Committee teleconference to discuss a letter that USHPA had written regarding the Torrey Pines Soaring Council. USHPA refused to allow me to attend. At my lawyer's suggestion, I agreed for him to send a letter asserting my rights as a Director to attend all meetings and have complete access to the corporation. I believe my lawyer was right. But USHPA refused, and I backed down in an effort to not escalate. I currently believe that was a mistake. I now wish I had taken my lawyer's advice and taken the USHPA Executive Committee to court to establish once and for all that Directors do have rights - as representatives of the owners of the corporation (members) - to attend and investigate every aspect of the corporation. In late 2014, the Torrey Pines Concessionaire - specifically Robin Marien - attempted to have a "Workplace Restraining Order" placed on me. There was a court trial, and I hired an attorney to defend me. We won the case, and I have been able to be at Torrey ever since. At the end of that trial, the Torrey Pines Concessionaire filed a lawsuit against me which I believe to be both frivolous and an effort to silence me through litigation (see SLAPP). I have hired a lawyer to defend me, and we have filed a counter suit against the concessionaire. That case is still working its way through the courts. I have been arrested 3 times, and placed in jail 3 times. All of those arrests were malicious and unjustified. I will be seeking redress through the courts and have consulted with a lawyer in obtaining it. I now know a lot more about the law than I did 10 years ago when I began seeking fair oversight at Torrey Pines. I also know a lot more lawyers than I did 10 years ago. I am again asking you - kindly - to retract (or delete) your statement that I have threatened "the Lightner family" in any way. This is my second request.